As soon as this book was released I immediately went out to pick up a copy. I must admit I was a little disappointed that it was written in the screenplay format again (as someone that grew up enjoying waiting for the next big fat novel to be released brimming full of detail), I do find that the screenplay doesn’t allow for a lot of detail to be added in. None the less I did enjoy this story more so then the Cursed Child (also written as a screenplay). This book read better then the cursed child and flowed a bit more fluidly. The story goes back in time to before the original Harry Potter series and stars wizard Newt Scamander. We meet him in 1926 where he arrives in NewYork with a suitcase full of magical creatures from the wizarding world. This whole new time era opens the world to adults even more so then Harry Potter did. The characters are of course older and more sassy in a sense I would say. We have Tina who is determined to find out what Newt is up to when she spots him in the bank. Queenie her sister is described as a typical 1920’s glamourous flapper. Newt himself is a quirky character trying to make his way in New York. They deal with issues that adults deal with. An example would be where Newt meets New Yorker Jacob who is visiting the local bank in order to secure a loan to set up a bakery, only he is downcast and rejected by them. So begins his adventure with Newt. The era for the story compliments the characters well. People are full of hope and life after the First World War. There is a sense of hope and adventure to be had which I think is portrayed well in Newts character. He has journeyed far from his home in order to seek out magical creatures and pursue the writing of his book. Queenie was one of my favourite characters as she seems so full of life and looks for the thrill in everything. The pace of this book is of course a lot faster then the first Harry Potter novels. Some readers may enjoy this more as it certainly doesn’t leave you time to become bored. Its a nice quick fast read. I completed it in two sittings. I’m not going to go into any spoilers here as if I did it would basically give away the whole plot and story. If you have read the book I would suggest also watching the film. I didn’t enjoy the film as much as I was hoping I would. To be honest I felt a bit let down by it. This might be partly my fault as I had built up a world in my own head. 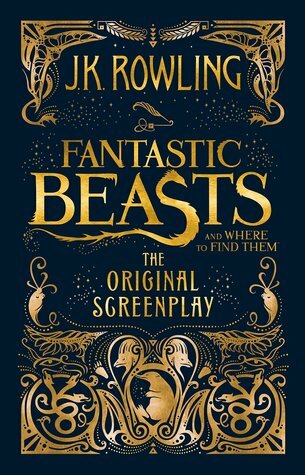 There is talk that Fantastic Beasts is one in a series of five so I’m hoping there will be books to go along with the up and coming films. Overall I did enjoy the read but I will always love the old style big novels full of description and detail. The book itself is illustrated beautifully on the front cover and throughout the book. I’m going to give Fantastic Beasts 4 out of 5 bookworms. As always I would love to hear your views on the book and the film. Which one did you prefer? Who is your favourite character? Please leave a comment down below letting me know. Thank you for dropping in to my little blog and taking a read. Popping in today with a quick blog post on my TBR list for August. Last month I didnt get chance to read many books at all so this month I’m detemrined to read more. I’ve got a stack of books slowly piling up that need reading and reviewing. I know we’re nearly at the end of the month now but I still wanted to post this list as it will also roll onto my Spetember TBR too. Okay lets get to it. Scarlett by Marissa Meyer. This is the second book in the lunar chronicles and is based on the fairy tale Little Red Riding Hood. A Court of Thorns and Roses by Sarah J Maas. This is the first novel in the Court of Thorns and Roses series. It follows Feyre, a nineteen year old hunter who finds herself taken captor by the faeires. Inherited by Freedom Matthews. This was one of the books I received in the July Fairyloot box. It follows the character of Lennie and her quest aboard the pirate ship the Wilted Rose. Frostblood by Elly Blake. This was the ARC copy I recieived in the July Fairyloot box.It follows the story of Ruby. She is a fireblood stuck in a world ruled by frostbloods who are intent on destroying all that are left of her kind. Dragonfly in Amber by Diana Galbaldon. The second installment in the popular Outlander series. I’m dying to read this book and find out what happens to Claire and Jamie.